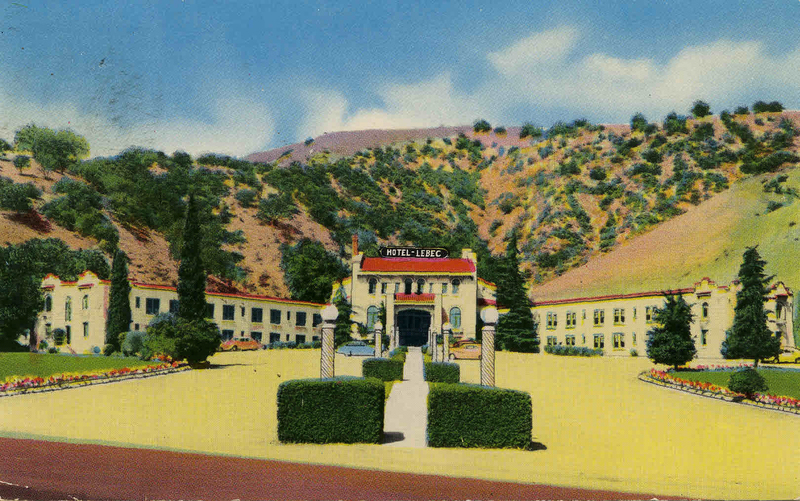 Color postcard, postmarked on reverse "Lebec, Calif., Sep 23, 1952"
On reverse side: "Lebec Hotel, Coffee Shop and Cocktail Lounge, Lebec, California. A favorite and logical rest stop for Santa Fe buses and tourists between Los Angeles and San Francisco on U.S. 99. Handwritten note on reverse addressed to Mrs. J.E. Hastings, 3982 Shirley Ave., Lynwood, Calif.: "Tues. Eve. 8:30, Dear Florence: We are at the Lebec Hotel. What you think of that? We got to Grapevine at 7:00 tonight. Near Castiac (sic). We tore out a rear end. Our job may take 2 hours or 4 days digging for a water leak. Room cost 2.75. Dinner 1.40. Love, Edna."